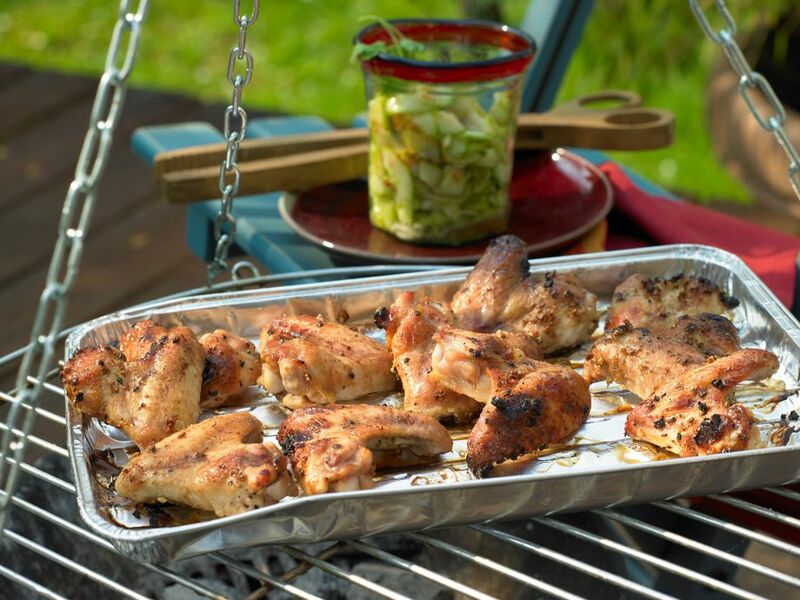 Marinated Chicken Wings - Crispy and delicious to nibble on: a must when grilling! 1 Rinse chicken wings and pat dry. Season with salt and pepper. Place in a large freezer bag. 2 Peel the garlic and finely chop. Rinse chile, cut in half and remove the seeds. If necessary, rinse again. Cut into thin slices. 3 Peel tough outer layer from lemongrass and trim both ends of stalk. Finely chop lemongrass. 4 Peel ginger root and finely grate. Combine ginger and garlic in a bowl. Stir in soy sauce and sherry (or more soy sauce). 5 Rinse 1 lime with hot water and rub dry. Finely grate the lime zest, then juice lime. 6 Add lime zest and juice with the honey to the soy-sherry mixture. Pour over the chicken wings, seal freezer bag well, turn to coat and let marinate for at least 3 hours in refrigerator. 7 Peel cucumber, cut in half and remove seeds with a spoon. Cut cucumber into thin slices. 8 Rinse scallions, shake dry and cut into thin slices. Put in a salad bowl with cucumber slices. 9 In a small bowl, whisk together chicken broth, sesame oil and chili sauce. Juice remaining lime. Stir lime juice into sesame oil mixture. 10 Pour the sesame dressing over cucumber salad. Season with salt and pepper, mix again and let stand for about 20 minutes. 12 Rinse cilantro, shake dry, pluck leaves and chop. Season salad again with salt and pepper, sprinkle with cilantro and serve with the chicken wings.